No tutorial today. Just this New Year Card I made using an Outlines image called Flying Peace Dove (here) and some numbers from an old Stampin Up set. Wishing everyone a very Happy New Year...filled with lots of Peace, Love, Joy, and Prosperity for 2012. Check back next week - starting Monday - when i will do a week's look at something I call The Never Ending Candle. This adorable card is not as difficult to make as it seems. I took a class a few weeks ago at the Ink Pad and the teacher used this card base in one of her projects. A package of the cards can be bought from Ink Pad in NYC or online from The Paper Cut. It's called an Outer Stair Step Card. But, not having these cards with me, I did some research and found it's not as difficult to cut, score, and make my own. For the blog post instructions on how to make an Outer Stair Step Card click HERE. Stamps: All stamps from www.outlinesrubberstamp.com - Crooked Fence (E-23) (here) , Star Light, Star Bright (H-1123) (here), Celebrate the Season (C-452) (here), Whimsical Star Tree (F-28) (here). Paper: White cardstock, Small piece of red cardstock 2 7/8" x 7/8"
1. Using template below, prepare card base. For my simple step-by-step directions on making an Outer Stair Step Card, click here. 2. Stamp the Snowman (Star Light, Star Bright) as shown below. I suggest using a stamp positioner if you have one. 3. Stamp the Whimsical Star Tree 3 times, trim and color. I trimmed the stars off the tree when I cut. It's just easier. Stamp the snowman on a piece of scrap cardstock. Color and cut the large star he is holding, his scarf, and the small layer of stamps on the right side of him. Stamp the fence, color and cut out. 4. Color in the snowman on the card front. 5. Using a glue stick or a Zig 2 Way Glue, glue the first tree to the back wall of the card. Make sure you notice where the white section stops and do not add glue to the top portion of the tree. 6. Take some small pop dots and adhere them to the lower 2/3rds of the next tree. Adhere this tree so it overlaps the first tree. 7. Using a glue stick or Zig Glue, adhere the 3rd tree but to the middle layer. Then adhere the fence so it overlays the 3rd tree. 8. Adhere some small pop dots to the backs of the star, scarf, and pile of stars and adhere on top of the snowman to give a 3D effect. 9. Adhere the phrase to the small piece of red card stock and then adhere to the card front. 10. 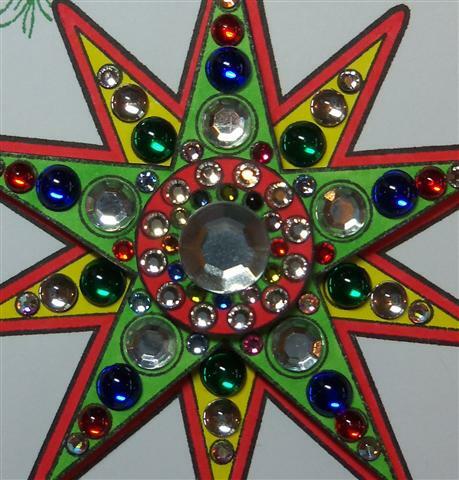 Adhere a crystal to center of star. 11. Sign card and send to someone special. I was informed that making this card base is a bit difficult and to just buy packages of the cards already made. But, after playing a bit, ruining a few pieces of paper, and almost losing my mind, I have figured out a simple way to make the template. I make one template to use for when I want to make additional cards. All you need, as far as supplies, is a piece of card stock, 8 1/2" x 5 1/2", a ruler or grid mat, a paper piercer or awl, an Exacto knife, a pencil, and a scoring board. (Please note, do not write on your cards like I have done in the photos. This is just for information purposes only). 1. Cut your card stock to 8 1/2" x 5 1/2". 2. Use a ruler or a grid mat, punch a small hole with a paper piercer or awl at - 1 1/4" from the bottom and 2 1/4" from the left side of card and then another small hole at - 2 1/4" down from the top and 2 1/4" from the left side of the card. 3. Line a ruler from the two punched holes and cut a line between the two holes using a sharp Exacto knife. The cut line will measure 5". 4. Turn card over and lay on a scoring board so that the wider section is at the top. 5. Score from top to cut line at 1 1/4", 2", 3", 4 1/4" (across the whole card), and at 6 1/4" to cut line. 6. Fold with mountain and valley folds as indicated in the photo below. 7. You will end up with a card base like this. 8. What I do is keep a template of the card with just the two holes punched as in No. 2, above. Then, when I want to make other cards, I just lay this template on top of a few sheets of card and punch a hole through the cards. Then just cut the line and score. 5 x 7 Cuttlebug Embossing Folder (Kassie's Brocade used in this project). 1. Cut a piece of red card stock 10" x 6 1/2". Score each side at 2 1/2" and fold. See template below. 2. Emboss a 5" x 7" piece of white card stock with the Cuttlebug Embossing Folder. Trim it to 4 1/2" x 6 1/4". Then cut that piece in half. You will have two pieces, 2 1/4" x 6 1/4" each. 3. Adhere each of these pieces, with double sided tape, to each flap of the card front, making sure to center each piece. 4. Stamp the Trimmed Tree on white card stock. I used Colorbox Black Pigment Ink and heat embossed with clear embossing powder. Color and trim. 5. Cut tree in half with exacto knife. 6. Using your die cut machine, cut and emboss the smallest die of the Spellbinders Flower Pot set. I used a craft colored card stock. Then cut this piece in half with an Exacto knife. 7. Adhere each side of the flower pot to the lower inside corners of the card front so that it covers the red but borders the bottom of the embossed white pieces. 8. Adhere each half of the Trimmed Tree to each side of the gatefold sides so that they cover a bit of the flower pot. 9. Take the 4 1/2" x 6" piece of white paper or cardstock, round the corners, and adhere to the inside of the card. 10. Adhere crystals in various sizes and colors or use Viva Decor Pearl Pens to add bling to the tree. Simple card to make - and I do not use any rubber stamps. Red cardstock - 8.5" x 5.5", scored and folded in half. Two pieces of white cardstock, 4" x 5.25"
1. Adhere one of the pieces of white paper to the inside of your card with double sided tape. 2. Using your die cut machine, emboss the other white piece of paper with the D'Vine Swirl embossing folder - or any other embossing folder you wish to use. Then, using the machine, cut out the capital "J" and "Y" from the Round-a-Bout Sizzix Alphabet. 3. Using a scrap piece of red cardstock, punch the snowflake. 4. Make a bow out of your ribbon, wrap around the card front, and tape or glue down each side on the back side of the paper. Then adhere to card front using double sided tape. 5. Center the "J", the snowflake, and the "Y" and adhere to the card front using glue of your choice. 6. Adhere each of the crystals to the snowflake using glue of your choice. 7. Sign your card and send to someone special. Although this card uses plenty of bling to make it shine, it's a great card for that special someone in your life. The card stock I used on the front of the card, with the silver border, is from a box of those wedding card sets found at any local craft store. When you see these sets on clearance, pick them up and use part of the cards in your projects. Stamps Used: Nova Star Jewel Ornament (H-1097) here and Evergreen Branch (E-188) - here - both from Outlines Rubber Stamp Co.
Paper: Red cardstock 5 1/2" x 8 1/2" scored and folded in half, 2 pieces of white cardstock 3 7/8" x 5 1/8". One piece will be for the front of the card, the other for the inside. Bling: to bling this whole image, you will need 70 crystals in the following sizes - 12 Size 9, 20 Size 12, 12 Size 16, 10 Size 20, 10 Size 30, 5 Size 40, 1 Size 48. You can see all the crystals (here). 1. Stamp Evergreen Branch with Memento Cottage Ivy at top of white card stock. 2. Stamp Nova Star Jewel Ornament image with Memento Tuxedo Black so it looks as if it is hanging off the branch. 3. Stamp Nova Star Jewel Ornament two more times. 4. Cut out the sections of the two images you will be using to layer and pop dot. 5. Color the front of the card image and the two cut out images as desired. As you can see, I only colored the edges of the center on the front image in the green since I know that this layer will be covered. And for the inside pieces, I colored over the areas that I know I will add bling or crystals since those areas will be covered. 6. Using double sided tape, adhere the card front to the red card base and the other piece of white paper to the inside of the card - to write your message on. 7. Adhere pop dots to the two parts you have cut out and then apply them to the card front. You will end up with 3 layers...the card front, the star as a layer, and then the circle layer. 8. Using Quickie Glue or any glue that will dry clear, adhere the crystals where you want them. For this card, I used crystals on the whole thing. A mixture of crystals from the USA and some from Brasil. 9. Add a holiday phrase at the bottom if you want. Sign your work on the back and send to someone that will appreciate the work you put into this!! Mixture of Crystals and Viva Decor Pearl Pens - with a Crystal in the phrase. Totally done with Viva Decor Pearl Pens.